The Tourist Boards of Munich – Upper Bavaria and Allgäu describe the Allgäu Alps as “a place where all is still right with the world”. Perhaps it is fitting then that we end our series of Bavarian blogs with this idyllic and mesmerizing mountain range. Those who enjoy exploring an area on foot will especially like this region hugged by Austria, Upper Bavaria and Lake Constance. “Go hiking or cycling through unspoilt nature, to calm fens and hidden lakes ideal for bathing, past neat farmhouses whose balconies are laden with flame-red geraniums…go from one mountain hut to another, climb famous peaks, enjoy fantastic panoramic views and conquer the remote world of the chamois, the ibex and the marmot,” add the Tourist Boards. 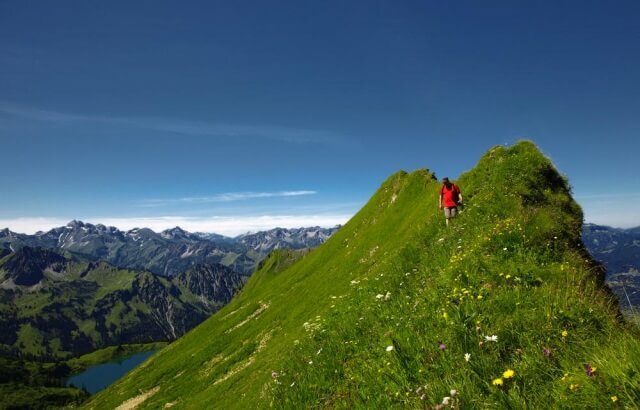 The Allgäu Alps boast 7,000 km (4,350 mi) of walking and hiking trails. Although mountain climbers may be used to higher ascents, the region’s biodiversity and landscape variety are rarely surpassed. There are also plenty of unique cultural opportunities as well, from indulging in renowned local cheeses to visiting historical landmarks like Neuschwanstein Castle and St. Mang Abbey. Eastern Allgäu: Eastern Allgäu is home to Hohenschwangau and Neuschwanstein (King Ludwig’s fairytale castles). While there you can climb up to the top of Tegelberg (1,881 m) to see stunning views of the royal fortresses, Lake Forggensee and the surrounding Alps. Although it takes approximately 3.5 hours each way, the hike is not overly strenuous. You can also choose to take the Tegelberg cable car for the ascent or descent. Also from the town of Füssen alone, there are 200 km of countryside trails. Upper Allgäu: Oberstdorf located within Upper Allgäu is often dubbed the “hiking village”. The village’s 220 square kilometres is made up of a multitude of mountains (including the ten highest peaks of the Allgäu Alps) and valleys. Seventy-five percent of the area has conservation or nature reserve status. You may choose to hike up one of the many mounts, such as Nebelhorn (2,224 m) where on a clear day you can observe up to 400 neighbouring peaks. (You can also take a cable car and enjoy more leisurely strolls at the top). Alternatively, you may opt for a more relaxing ramble, such as at the nearby Breitachklamm gorge, a trek fun for all ages. Western Allgäu: Western Allgäu is known for its serene and pristine landscapes of lush forests, rolling hills and vivid lakes. Boundless kilometres of both leisurely and challenging trails await you. For example, the Nagelfluhkette nature park alone offers 300 km of short and long distance trails. While navigating the paths you may see a wealth of wildlife including capercaillie, mountain apollos and golden eagles. We hope you have enjoyed our series on the Bavarian Alps. Now it is time for you to experience this German wonder for yourself!